Many in the world anti-communist movement (including this writer) are concerned that the 15 year "thaw" in Russia is drawing to a close. Seemingly, the "best" we can hope for is a semi-fascist Russia, with some private production, monitored by an authoritarian government. China with more snow and fewer bicycles. The worst case scenario would be the re-assertion of communist control and a reborn and revolutionary, Soviet Union. Once Upon a Time in the West is one of the best sources of news on the new reality in Russia. OUATITW's latest post is a magnum opus on the state of politics in Russia, particularly the communist movement which is growing increasingly powerful and assertive. The Moscow Times reported on August 2, 2005: "Jailed oil magnate Mikhail Khodorkovsky warned in his first missive since he received a nine-year prison sentence that unless the current authoritarian regime made way for a leftist, social-democratic alternative, huge upheaval was inevitable." Khodorkovsky confidently affirmed in one of his letters from prison: "The leftists will win anyway. They'll win democratically in full accordance with the free will of the majority of the electorate . . . with or without elections. The turn to the left will take place. The post-Soviet authoritarian project in Russia has exhausted its resources." Here we see the shallow and purposely deceptive nature of Russia's post-Soviet "capitalists." Much as Latin America's "ex"-communist-terrorists have taken over the region through the ballot box, the restored CPSU intends to do the same, creating an aura of legitimacy that it lacked in the past. In October 2005 Yabloko’s Grigory Yavlinksky and Nikita Belykh, referred to "the political heirs of the Communist Party of the Soviet Union, who appeared and continue to appear on the scene under different names, but have always represented de facto a united bureaucratic nomenclature belonging to the same "clan” United, indeed. The Soviet communists have never abandoned their totalitarian project nor their intention to export Leninist revolution overseas. According to the party's own information, the CPRF has 580,000 members in 2,362 local and 17,500 primary organizations, and attracts more than 18,000 new members each year. 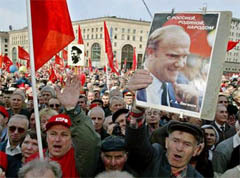 OUATITW believes that the communists plan to win the 2008 presidential election and then will begin the re-assert Soviet power. It is obvious to any objective observer,that if the myriad communist parties currently active in Russia were to unify their efforts, no political force could match them. They could assume power now. That they do not is probably more a matter of strategy than ability. I am not quite so bold as to predict that this will occur in 2008, but I will be surprised if does not occur in the next few years. The West needs to face reality. Russia is not our friend, she is China's friend now. That is not a nice thing to contemplate, but it is a reality. I'm not surprised about this. I'm just still quite amazed to see how many people refuse to recognize the threat before it's too late. I know you profess to be a Libertarian, but I should warn you about the American Libertarian Party isn't what is seems to be. It may profess to downsize D.C. and get rid of those wasteful government departments that go nowhere, but one of the LP's candidates was the late Harry Browne whose bio can be found via wiki and he wrote some pretty unAmerican, not-so-pro-Western things such as attacking people who states are "demonizing" Syria along with stating that Larry Elder wasn't Libertarian enough. Just wishing to give you the heads up on people who may proclaim to be Libertarian and right-wing, but adopt Leftist tactics when it comes to attacking people even within their own camp. That's all. I should also warn you that the Libertarian Party was founded by the Koch family who took part in its politics. In my latest profiles, I detail how Koch Industries has taken interest in "former" Communist Russia for its oil along with its main founder being involved in the creation of the John Birch Society and having a oil refinery in Soviet Russia during World War II. Thanks MAH. I think it is true that many libertarians are pretty naive when it comes to Marxism-Leninism. Many libertarians are pretty optimistic souls and believe that free trade and the free exchange of ideas will melt the stoniest totalitarian heart. Many also reject any hint of "McCarthyism" as being illiberal and are naturally suspicious of the power of the military industrial complex. I am a libertarian through and through, but I have no illusions that the evildoers in this world will be nice to us, if we are nice to them. Consequently, free trade and free borders, must sometimes come second to national defence. The late great Ayn Rand, a major hero in the libertarian movement, testified before the House Unamerican Activities Committee, because she quite rightly saw the threat posed by subversives in the movie industry. She was also a superhawk on national defence. I have read your very good posts on the "faux" right and though I think you are right on with the Nazis, the White Priders, etc being pawns of the left, I think you are overly harsh on the libertarians, the JBS, Pat Buchanan etc. Freedom means little without the means to defend it. That is why I am so interested in subversion and security issues. However I believe to a fair degree, in "No enemies on the Right". Therefore I am loathe to condemn those libertarians and conservatives who share many of my values, but are either naive, misinformed or less concerned with security issues. Well, if you check out Justin Raimondo who proclaims to be a "Libertarian", he has pandered to Vladimir Putin in the death of the late KGB-FSB defector. Along with Pat Buchanan joining along the way. Yet Raimondo wrote "A Fascist America" and also referred Americans to being "barbarians". Gee, what a nice fellow to go and defend a tyrant like Putin. He's just like Ramsey Clark. Stating how "totalitarian" America has become, but defends a mass murdering dictator or a dictator like Putin or in Clark's career, he has defended people like Slobodan Milosevic, Nazi war criminals, terrorists and other dictators like Saddam Hussein. As someone who has studied in Russia and has a passing familiarity with some of the internal parties, I am astonished that the senior figures of the "Yabloko" (Apple) political party are described as heirs to the communist party of the former Soviet Union. Yabloko, (at least back in the late 1990s) was possibly equivalent to ACT or a Ruth Richardson National Party - heavy free market orientation. They don't dound much like communists to me. If anything, Yavlinksy's bio on Wikipedia sounds very much like he's from ACT. The idea that a resurgent Russian communist leadership will be any threat to the US is frankly a joke. They failed during the first cold war and no prospect of creating an industrial power base from 170m aging Russians when compared with the dynamism of North America. The US has far more to offer China by buying its products to keep rural to urban migrants happy than Russia does. Germany & the EU will suffer increased energy prices which will hinder its growth but little else. Seriously is Russia going to supply energy to china at a fair price or Europe at an extortionate price. Without energy Russia has nothing to offer china. Nationalist KGB with Putin as their current face will have power in Russia for the foreseeable future. They control the media and are less obviously corrupt than the Communists. Has anyone looked at Russian opinion polls lately? Putin has strong support. Khodorkovsky is talking self serving BS. The state strong armed back assets that were stolen by oligarchs in the first place. Political scientists do not prophesy. They can only make predictions based on information at hand. This we have done at Once Upon a Time in the West. The evidence is compelling that in 1991 the Communist Party of the Soviet Union, which only abandoned its public monopoly of power, has continued to direct the affairs of Russia. In his observations Sagenz completely ignores the massive documentation at our website and related sites such as Jeff Nyquist's--including the testimony of Soviet Bloc defectors who have written of communism's long-range deception strategy. Furthermore, Aaron incorrectly states that Yabloko leaders are heirs of the old CPSU. Rather, Yabloko leaders have testified that the heirs of the old CPSU still control Russia.